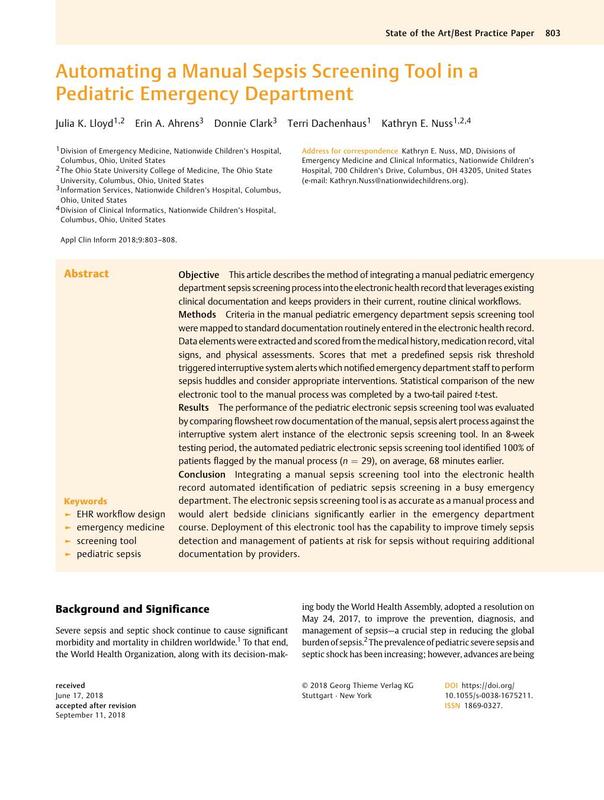 Objective This article describes the method of integrating a manual pediatric emergency department sepsis screening process into the electronic health record that leverages existing clinical documentation and keeps providers in their current, routine clinical workflows. Methods Criteria in the manual pediatric emergency department sepsis screening tool were mapped to standard documentation routinely entered in the electronic health record. Data elements were extracted and scored from the medical history, medication record, vital signs, and physical assessments. Scores that met a predefined sepsis risk threshold triggered interruptive system alerts which notified emergency department staff to perform sepsis huddles and consider appropriate interventions. Statistical comparison of the new electronic tool to the manual process was completed by a two-tail paired t-test. Results The performance of the pediatric electronic sepsis screening tool was evaluated by comparing flowsheet row documentation of the manual, sepsis alert process against the interruptive system alert instance of the electronic sepsis screening tool. In an 8-week testing period, the automated pediatric electronic sepsis screening tool identified 100% of patients flagged by the manual process (n = 29), on average, 68 minutes earlier. Conclusion Integrating a manual sepsis screening tool into the electronic health record automated identification of pediatric sepsis screening in a busy emergency department. The electronic sepsis screening tool is as accurate as a manual process and would alert bedside clinicians significantly earlier in the emergency department course. Deployment of this electronic tool has the capability to improve timely sepsis detection and management of patients at risk for sepsis without requiring additional documentation by providers.